Cartridge Heaters | Gordo Sales, Inc.
Cartridge heaters are some of the most versatile and durable process heating elements. They are useful in myriad applications, from assembling medical care devices to heavy-duty manufacturing of aircraft, truck and rail car components. Gordo Sales, Inc., offers the highest-quality cartridge heaters at the best prices. You’re free to choose from a wide range of imperial and metric diameters, lengths and wattages. If you don’t find the wattage or configuration you’re looking for, we allow special orders and ship within one to 10 business days. 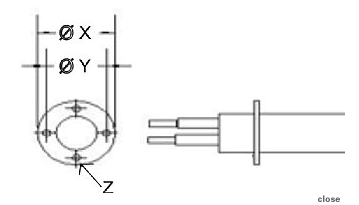 Cartridge heaters are often confused with tubular heaters. While both systems are tube-shaped and have a similar internal makeup, they serve dramatically different applications. Tubular heaters are inserted into ovens and vessels for air heating, placed directly into a liquid or clamped into vessels. Cartridge heaters, on the other hand, are inserted in drilled blind holes or open holes for efficient transfer heating. Unlike tubular heaters, cartridge heaters have swaged designs, which allow for higher-watt densities (up to 260 watts) and high-temperature applications (up to 1,400°F or 760°C). We only supply cartridge heaters with a heavy-duty sheath material that’s robust and resistant to shock and vibration. Like most process heating systems, control is a critical requirement for cartridge heaters, especially in high-watt and high-temperature applications. We carry a line of digital temperature sensors and controllers that let your employees precisely maintain cartridge heaters at a constant temperature. Our experts can help you find a controller, sensor or actuator that will seamlessly connect with your cartridge heaters. When choosing cartridge heaters for your facility, it’s important to choose the size and length that fits snugly with your drilled holes. With a tighter fit, the heater will run more efficiently and last longer. By choosing Gordo Sales, Inc., you’ll not only get products manufactured to the highest industry standards, you’ll also benefit from our extensive product knowledge and exceptional service. Compare High Density with Low Density cartridge heaters. --Select Diameter-- 1/8" 1/4" 3/8" 1/2" 5/8" 3/4"